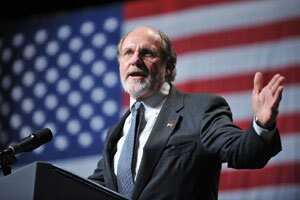 MF Global CEO Jon Corzine resigned. File photo. New York: Jon Corzine has resigned as MF Global Holdings Ltd’s chairman and chief executive, four days after the futures brokerage filed for bankruptcy protection, culminating a rapid downfall for one of Wall Street’s best-known executives. Corzine, 64, had run Goldman Sachs and Co. from 1994 to early 1999, and was later a US senator from New Jersey and governor of that state. MF Global, a company that Corzine joined in March 2010 and had once joked was viewed as “too small to care about", had been his ticket back to Wall Street. The New York-based company’s decline accelerated last week after it revealed more details about this exposure, posted a larger-than-expected quarterly loss, and was downgraded by major credit rating agencies to “junk" status. US regulators, meanwhile, are conducting a broad review of the company’s business as they try to track down more than $600 million of missing customer money. It is unclear how Corzine’s resignation might affect the various investigations. Neither MF Global nor Corzine has been accused of wrongdoing. In a statement, Corzine said his “difficult" decision was voluntary, and was best for the company and its stakeholders. “I feel great sadness for what has transpired at MF Global and the impact it has had on the firm’s clients, employees and many others," Corzine said. “I intend to continue to assist the company and its board in their efforts to respond to regulatory inquiries and issues related to the disposition of the firm’s assets." Corzine is not seeking severance, the company said. He had been entitled to a $9 million payout if he were let go without cause, a July regulatory filing shows. MF Global said chief operating officer Bradley Abelow and lead director Edward Goldberg will remain in their positions. The company’s bankruptcy is the seventh largest in US history, according to BankruptcyData.com and Reuters data. A trustee plans to liquidate MF Global’s US broker-dealer unit. Brokerages such as MF Global are required to keep customer money segregated from their own cash. Questions about whether MF Global failed to do this have attracted the attention of the Federal Bureau of Investigation as well as regulators. Corzine has hired prominent white-collar defense lawyer Andrew Levander of the law firm Dechert to represent him in cases that might stem from the bankruptcy filing, a legal source briefed on the matter said on Thursday. Levander has represented outside directors of Lehman Brothers Holdings Inc. and former Merrill Lynch and Co. chief John Thain, among others. Corzine hired another lawyer, Schuyler Carroll of Perkins Coie, for the bankruptcy case. “We will look at every aspect of how the firm conducted business," Mary Schapiro, chairman of the US Securities and Exchange Commission, said on Thursday. Corzine’s decision to join MF Global surprised many on Wall Street at the time. He has referred to himself as a “recidivist banker", saying that financial regulatory reform would force big banks to shrink, leaving growth opportunities for potential rivals that were “too small to care about". One of the biggest market concerns about MF Global had been its roughly 33-to-1 leverage ratio, with well in excess of $40 billion of assets despite having just $1.4 billion of equity. Jennifer Ablan, Matthew Goldstein, Jed Horowitz, Jennifer Merritt and Jonathan Stempel in New York contributed to this story.